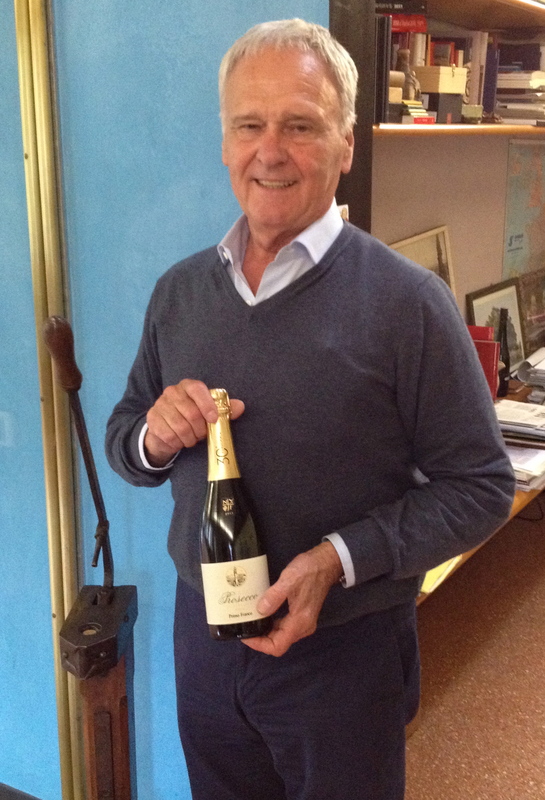 Recently, I met with Primo Franco of the Prosecco house Nino Franco in New York. We were tasting and drinking his Prosecco and I mentioned that Michele and I would be in the town of Asolo in the Veneto the following week. Primo smiled and said that the town is less then 20 minutes from his winery and we must come and visit. It was an offer I could not refuse. Primo picked us up at our hotel and on the way to the winery gave us a tour of the vineyards. He said there had been some heavy rain and hail damage but the vines were recovering. When we arrived at the winery Primo showed us the tanks and explained that almost all Prosecco is made by the Charmat method. After the grapes are crushed and fermented, a secondary fermentation takes place. Sugar is added to the wine and as the yeast “eats” the sugar it produces the pressure, which creates the bubbles in the wine. The tanks have a double wall of heavy steel because of the pressure inside the tank. There is insulation between the walls. The wine remains on the lees at 8°C under pressure and is kept there until it is ready to be bottled. Primo said that in the past the winery made wine from many different grapes but starting in 1983 when he took over all they now make is sparkling wine. 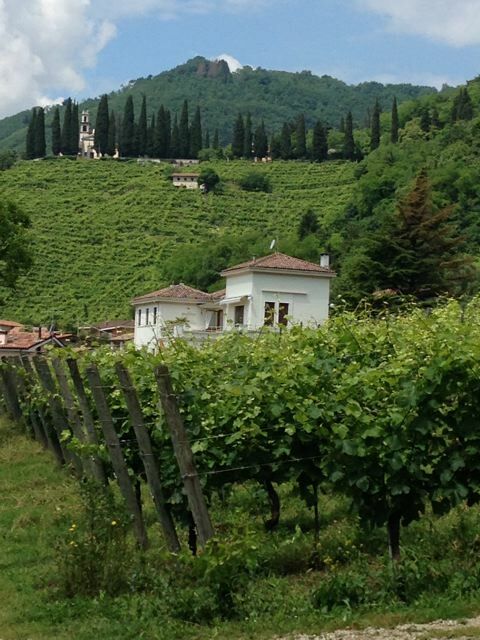 Primo explained the new laws for Prosecco that went into effect from the 2009 harvest. He said that the historical area around the two towns of Conegliano and Valdobbiadene would now become DOCG. The zones that were IGT would now become DOC, and the rest IGT. This DOC would include the 9 provinces of Treviso: Vicenza, Padova, Belluno, Venezia, Pordenone, Udine, Gorizia and Trieste. Only the producers in the DOC and DOCG zones will be allowed to call their wine Prosecco, while those in the IGT zone will have to call it Glera. 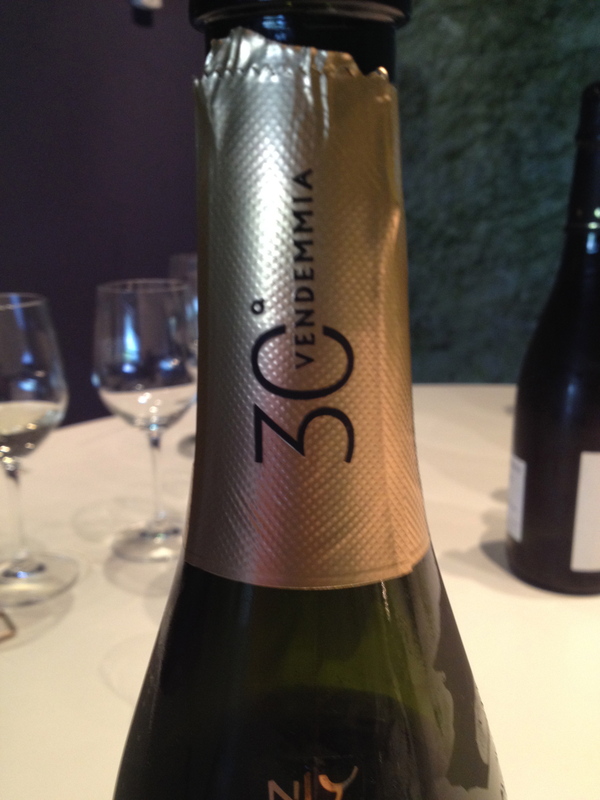 The term Prosecco will be used to identify the region that the wine comes from and the grape will be Glera. The historic area of the appellation remains the same. Under the new law, a producer cannot make a “Rose Prosecco” (which I always saw as a contradiction in terms), nor have the words “Prosecco Blend” on the label. Prosecco is now produced all over the world, even in Brazil. Primo hoped that the new laws would preserve Prosecco’s identify and integrity and that the new regulations will help people to understand that true Prosecco only comes from the DOC/DOCG zone. Primo told us of going into a store in NYC that sold only Italian wines. He spotted a Rose Prosecco on the shelf, and could hardly believe it! Primo feels that these new laws are necessary to protect the true Prosecco and it was important that everyone should know them. At the winery, we tasted vintage Primo Franco Prosecco going back to 1992, which was first produced in 1983 when Primo took over the winery. Primo started us off with a glass of wine that he took from the tank. He wanted us to taste the wine that he starts with before it becomes sparkling. Primo made a point of saying that you must start with a good white wine in order to make good sparkling wine. Valdobbiadene Prosecco Superiore DOCG Primo Franco made from 100% Glera grapes. It is classified as dry meaning it has 17 to 32 g/l residual sugar and the alcohol content is 10.5%. Malolactic fermentation does not take place. We tasted the 2013 and the 2003 together because Primo felt that they were very similar vintages. 2003 was very warm and half of the harvest was in August and the other half in the beginning of September. He said that 2013 had very hot days and cold nights. The 2013 has a lingering peach aspect to it. The 2003 was a revelation for me. I always believed that Prosecco is a wine to be drunk young. 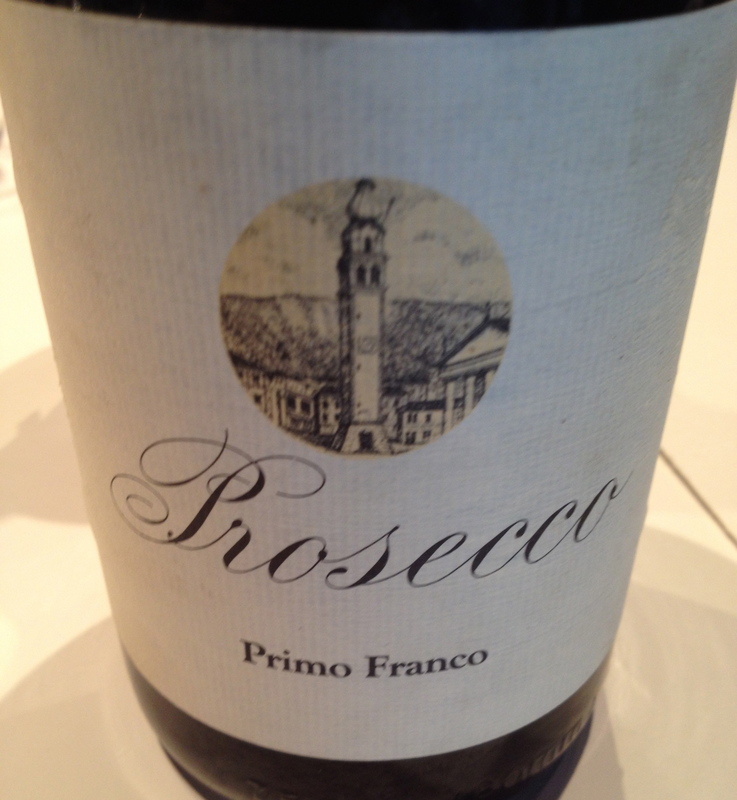 This Prosecco was lively and fresh, complex with a depth of flavor and hints of ripe apple, almonds and lemon peel. The 2000 was drinking very well. It was smooth and creamy with hints of honey, a long finish and pleasing after taste. 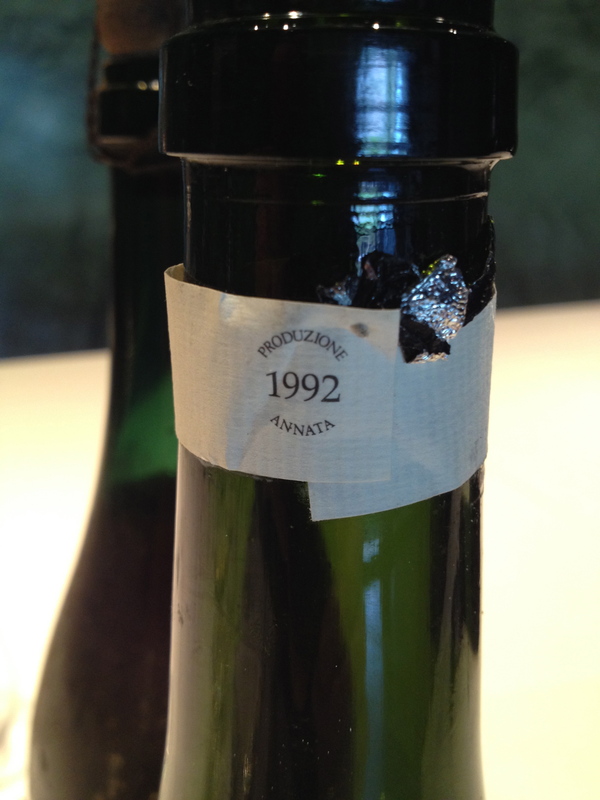 The 1992 — I could not believe how well this wine was drinking. Primo showed us a bottle of 1956 Prosecco that he had in the cellar buy it was only for display. 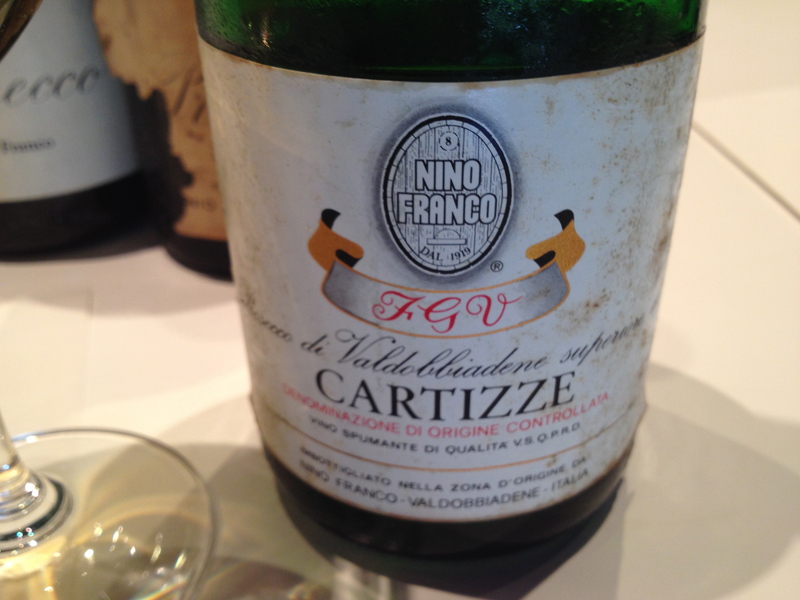 Last but not least was a bottle of 1985 Prosecco di Valdobbadene Superiore di Cartizze, “Dry” 100% Glera from the Cartizze hills. Grapes grown on the 1,000 ft high Cartizze are the most expensive in the zone and make the highest price wines. There are 140 producers that share the vineyards. Made by the Charmat method. This wine was showing some age but is still quite drinkable. We were fortunate to be invited to Primo’s home for lunch. 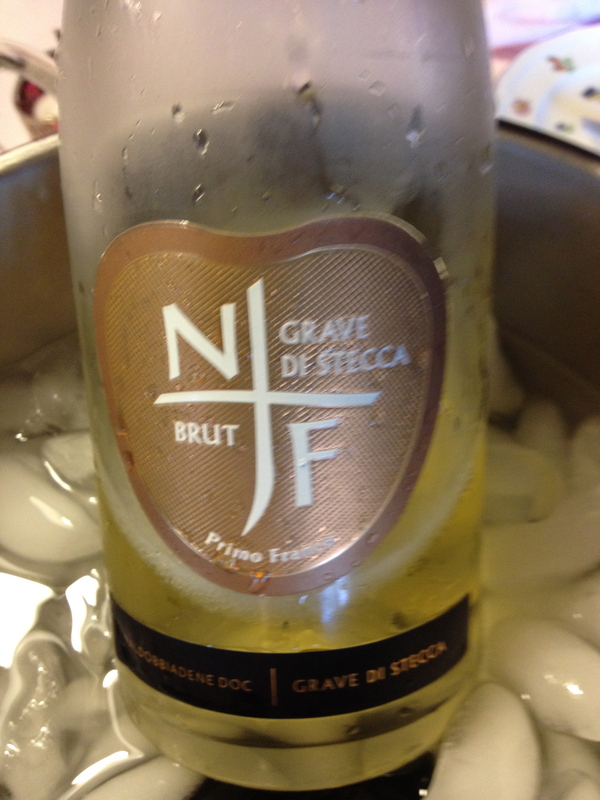 With lunch we had the Grave di Stecca Brut sparkling wine. The vineyard is of ancient origin “Grave di Stecca” a clos on the slopes at the foot of the Pre-Alps, not far from the square of Valdobbiadene. It has a southern exposure and is partly shielded by a huge garden and has a special microclimate. Made from 100% Glera grapes. The alcohol is 12%. 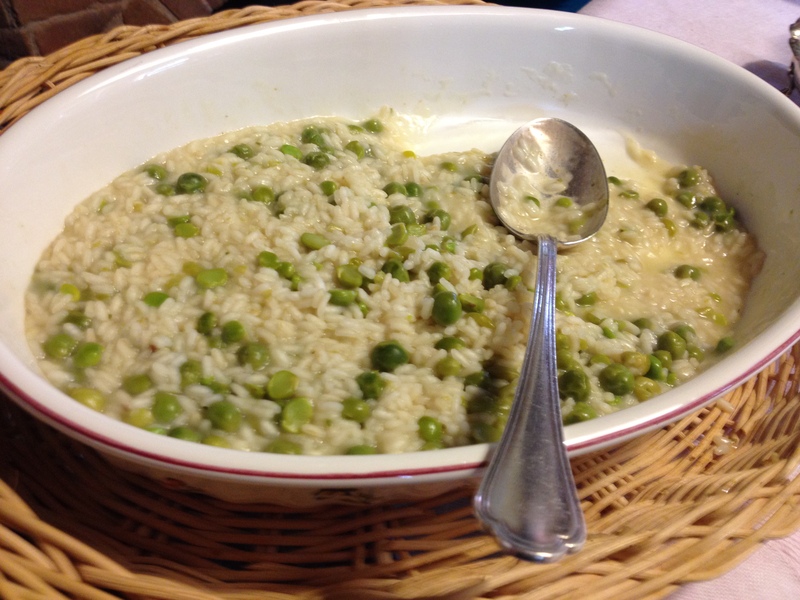 This was a perfect combination with the Risotto with Peas prepared by Primo’s wife AnnaLisa. Valdobbiadene Porsecco Superiore “Brut” DOCG 1 to 12% g/l residual sugar from the Valdobbiadene and Conegliano production area. Valdobbiadene Prosecco Superiore “Dry” DOCG “Rustico”. All of the above are 100% Glera and are made by the Charmat method. He also makes a sparkling wine “Faîve,” a brut made from 80% Merlot and 20% Cabernet Franc also by the Charmat method.